Must present when service order is written. One coupon per customer. May not be combined with other offers. Not applicable to prior purchases. Not responsible for any typographical or printing errors. Other restrictions may apply. Max savings with this coupon=$150. Not applicable on oil changes or tire purchases. Must present when service order is written. One coupon per customer. May not be combined with other maintenance specials or offers. Not applicable to prior purchases. Not responsible for typographical or printing errors. Other restrictions may apply. Please present coupon when order is written. Not valid with any other offer or special, web or print. One coupon per customer, per visit. Toyotas only. 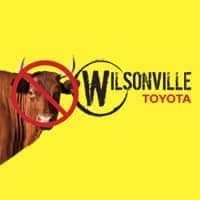 Valid only at Wilsonville Toyota.